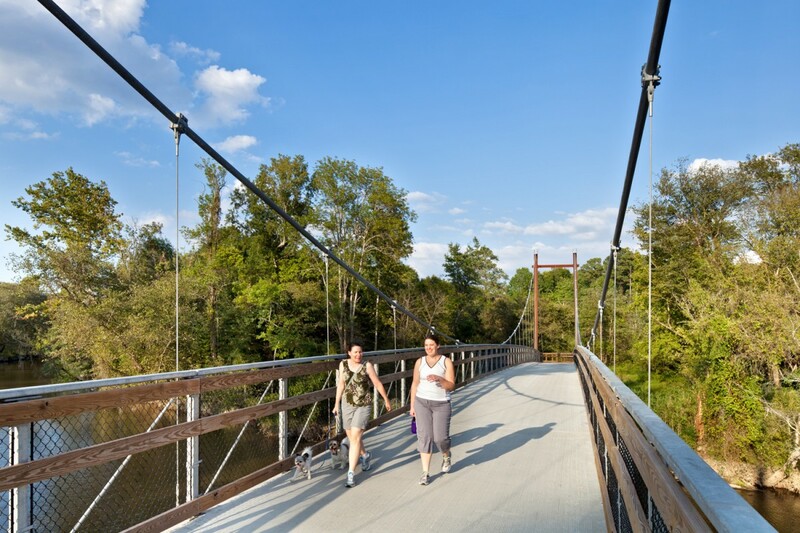 Stewart performed bridge siting analysis studies for a total of seven pedestrian bridges over the Neuse River as part of the City of Raleigh’s Neuse River Trail project. The process included extensive field investigation, surveys, hydraulic analysis, cost analysis and bridge design. Spans range from 200 feet to 600 feet, with many bridges needing to span the entire river to avoid floodway impacts. 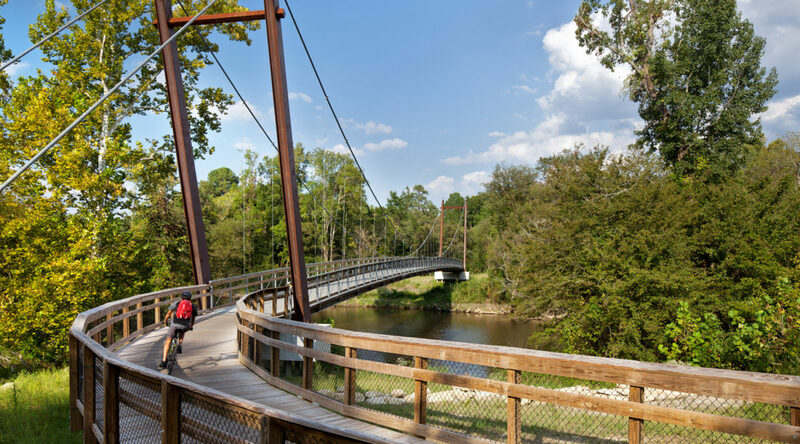 In order to create a more competitive bidding environment and solve some of the construction challenges associated with placing large prefabrication bridges in sensitive riparian areas, Stewart added custom suspension bridge options at Horseshoe Farm Park and Skycrest. 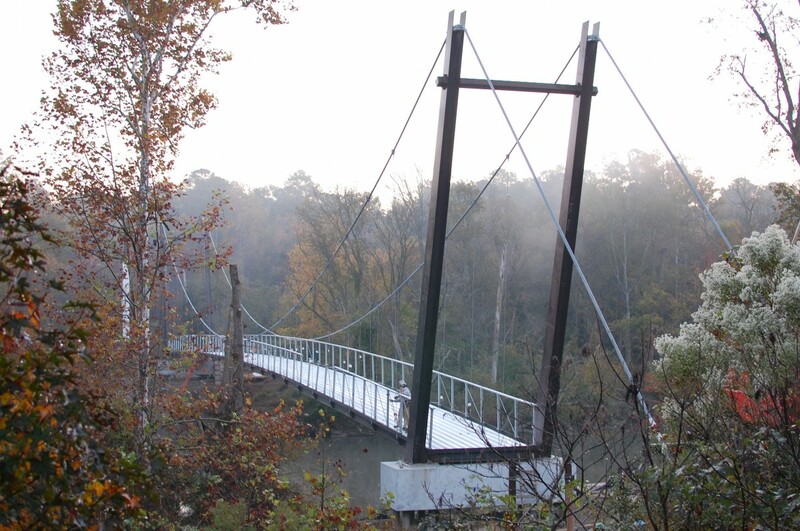 The two 275 foot single span suspension bridges consist of structural steel framing and concrete decks. Controlling vibrations and deflections was accomplished by utilizing the bridge guardrail to stiffen the structure. Additionally, rock anchors were used to resist the large tension forces applied to the foundation by the main suspension cables. 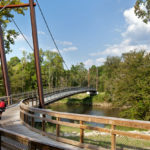 These suspension bridges will save the City of Raleigh over $1.2 million over traditional prefabricated steel bridges. 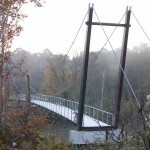 They will also serve as a unique attraction on the Neuse River Greenway Trail since suspension bridges are not common in the Triangle area. First two photos by Sterling E. Stevens Design Photo. 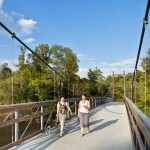 For more information on the greenway itself, click here.